Winscape will let you replace that garbage-strewn ally view with just about anything you want. The two windows above are actually plasma screen televisions. In between them you can spot a Nintendo Wii Remote that is used to track an IR badge worn by the person in the room. As they move, the images on the screens are changes to simulate the change in perspective you would see out of a real-world window. Take a look at the video after the break. This is unfortunately not an open source project but the software is available for trial and we find the concept interesting. If you can write video processing algorithms you may be able to take the Wii Remote Whiteboard concept and turn it into a Winscape clone. But I bet the effect is strange for a second viewer who sits still while the badge wearer roams around. Now to link it to live cameras and market it as a product. Looks like it’s only for Mac OS; as said it is closed source, but fairly cheap compared to the equipment required to run it. I don’t think it’d be too hard to make a similar open source copy. A good idea, interesting proof of concept, but something that didn’t rely on hardware worn by the user would be way better. Something like natal that tracked the user in the real world. Hey, maybe natal will have something like this. Somebody actually intends to sell this? Its a great gimmick but since you need to wear a special badge and works for one person only, who on earth would pay for it? Closed source, pffft. Keep dreamin. this is like that cube posted a couple days back, but from only one viewpoint. This is actually very cool, and I’d love to have one of these, unfortunately the need for a tracking “badge,” not to mention the size of it is rather a huge turn off. As a user pointed out they need to implement a tracking camera, where no badge is needed, and anyone who walks by can be tracked. Very cool concept though, however needs some work. But are we also supposed to use some sort of variable-pitch parallax barriers so we can treat multiple persons differently? It would get loud and lo-res really fast for all but the loneliest of us. 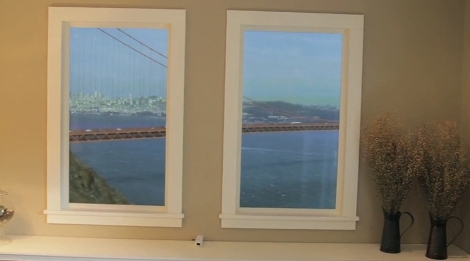 just buy a house by the Golden Gate and you dont need this stupid hack! those new 3d tvs can display 2 pictures at once, depending on the angle. This seems like an incredibly overwrought hack to recreate what could be done with some high-DPI printing, a backlight, and microlens arrays. Even a single-axis-parallax lenticular display would provide better binocular and multi-user support at a fraction of the cost. This is truly amazing!!!!! I am impressed. I’m sure there are flaws but still WOW!!! Isn’t the wiimote here just being used as an IR webcam? Wouldn’t a $5 webcam be cheaper and easier to integrate and hide in the wall or something? They use wiimote because it uses bluetooth, and there are already programs available to connect it easily to the computer. Good idea, but bobdole is right – webcam would be and would allow you to do face tracking instead of wearing some stupid badge. this technology would make for a really cool video game. That’s the coolest thing I’ve seen in a while; very creative use of technology. The simplest method is a depth of field trick used by carnival shows. Shine a projector onto the wall, place a false wall 30 inches in front of it. Build your windows into the false wall, viewing the projection screen. As you walk around the room, you see the view from whatever angle you are actually standing at. The only caveat is that you have to be either viewing a long distance shot or the view would change too much with the minor movements from your head. However, a combination of this trick with the auto tracking shown above should be able to give the best of both worlds. At more than 24 inches, you rely on the old carnival trick to handle the view adjustments, and at less than 24 inches ( when you’ve walked up to the widow ) the image itself can be adjusted by the above software. thst is a very good idea. seriously. i only read the comments for this thread to see how this window gets bashed. two plasma displays for a dedicated fake window? tracking broach? lame. again, mindbleach’s idea rocks. simple+cheap+cool=perfect. This is remarkably similar to…. I’m with mindbleach. And if you still want to drop thousands of wingwangs on LCD monitors, you can always use the barrier display tech on them and save a ton on other hardware and power costs. If you really feel the need to do this, use a cheap webcam and YAWCAM (java webcam security software), and the carny trick eldorel talked about, and spend a little money on a projector. Then you can implement any kind of effect you want, from a disney-esque magic mirror, to a “Duck Hunt” video game, to whatever you can dream of. or just go to the homebrew page on the Wii click on the Demos and download the app yourself for free….. THIS IS NOT A HACK !!! That’s awesome. I can see it working very well as an anti-cabin fever aid in isolated or underground rooms. I can see this being a good replacement for the ‘artificial sunlight’ systems in underground bunkers or silos. It’s still a garbage-strewn view. It’s just now you’re viewing a bunch of garbage you paid a ton of money for. You can bet that anyone who designs a bunker meant for long term living will be thinking of something like this to put in there. As usual, only a handful of people even get the point. Do your windows run Linux? That my idea :) No seriously, is there a technology to make it work for multiple viewers, that would be cool? This should be used to create the Zombie Apocalypse. Why this as news post? THis isnt new, i know this already for a few year from a person who knows a lot about this. Why do they now or this is new? Becouse some guy or girl makes a movie doesnt make anysense to be posted. Didn’t they have windows exactly like this in Total Recall?